While writing a thesis on the current labor market expectations in the 21st century’s knowledge-based economy, I had the chance to thoroughly examine recent and prospective developments in the labor market. This blog story will focus on the employers’ labor market expectations and explain underlying reasons behind increasing overall unemployment rate. Labor market expectations have been in a state of flux. In today’s global market, having a broad range of skills in addition to having solid educational credentials is of vital importance. Therefore, a more powerful and sustainable economy depends on equipping employees, particularly young generations, with these skills. When looking at the statistical data and research done by both national and international institutions worldwide, it seems that unemployment rate globally is somewhat on the increase, particularly in developing countries. While unemployment rates and labor market expectations take place at an accelerating pace, research shows that younger generations are badly affected insofar as they fall behind to meet these expectations. So, let’s take a look at some of these data and research and get a better understanding of the causes of increasing unemployment rate. ‘Youth Unemployment Visualization 2013’, which is prepared by ‘World Economic Forum’, provides detailed information about unemployment rate globally based on some descriptive statistics. According to this visualization, “Youth make up 40% of the world’s unemployed and a youth’s risk of being unemployed was three times higher than that of an adult in 2011”. While youth in developing countries are more likely to be unemployed, youth in developed countries have also been struggling to find jobs and have being forced into part-time jobs. The graph below, which is designed by ‘International Labor Organization’, also shows global youth unemployment rate. 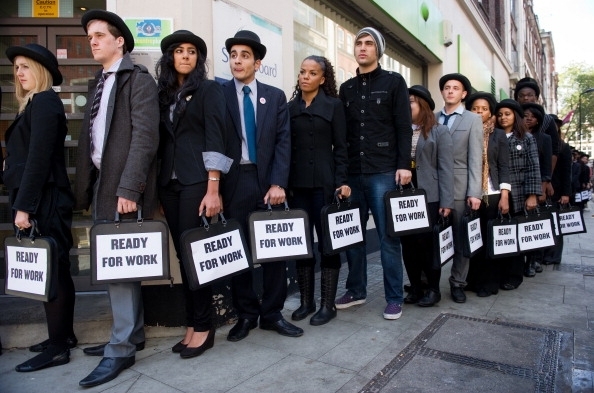 So, what are the underlying causes behind this increasing unemployment rate? In his article entitled ‘Addressing the Youth Unemployment Crisis in the Middle East’, Jamie Mcauliffe mapped out the reasons behind increasing unemployment rate. Although the article particularly focuses on the Middle East, research results shed light on current global unemployment issue as well. According to Mcauliffe, one of the main reasons stem from “the dearth of work-relevant education and skills”. Many college graduates have a hard time upon their graduation since most of them cannot gain practical skills essential for getting a job in the market. This may result from the fact that college education mostly provides theoretical information rather than focusing on practical applications. Hence, gaining practical skills for college graduates may be difficult. While the lack of practical skills has a detrimental effect on getting jobs, the lack of soft skills such as critical thinking, problem-solving, and communication also has a negative effect on getting employed. Thus, having both soft skills and practical skills is equally important in the labor market. A growing consensus is emerging among policy makers who claim that “not only more but better education and training is needed in developing economies”. As International Labor Organization’s report “Global Employment Trends for Youth 2012” highlights, it is necessary to address these challenges and take necessary steps in areas such as ‘Macroeconomic and Growth Policies; Active Labor Market Policies and Programmes; Labour Standards and Social Protection for Young People; Social Dialogue and Partnerships for Youth Employment; Supporting Strong Labour Market Information and Analysis Systems’. Active labor market policies such as strengthening close relations between employers and educational institutions, providing skills development programs for younger generations, and addressing skill mismatches can help alleviate unemployment rate to some extent. Besides, only generating jobs would not be enough for a better economy and coping with an increasing unemployment rate. There is also a need to ensure appropriate working conditions for employees and to create a continuous dialogue and partnerships between government and both employers and unions. By contextualizing global youth unemployment in light of these policies, we are more likely to come up with multiple viable solutions for ensuring better labor market prospects.